24 September to 21 October 1915 - admitted to No.2 Australian Stationary Hospital, Mudros - cystitis. August to October 1919 - admitted to Timaru Hospital February to March 1920 - admitted to Hanmer Military Hospital - neurasthenia. George was the youngest son of James (1815-1894) and Catherine (1836-1905 nee Turner) Shelly, born at Orange, New South Wales, Australia on October 25, 1880. He came out to New Zealand as a young man and was involved in many activities in Timaru. 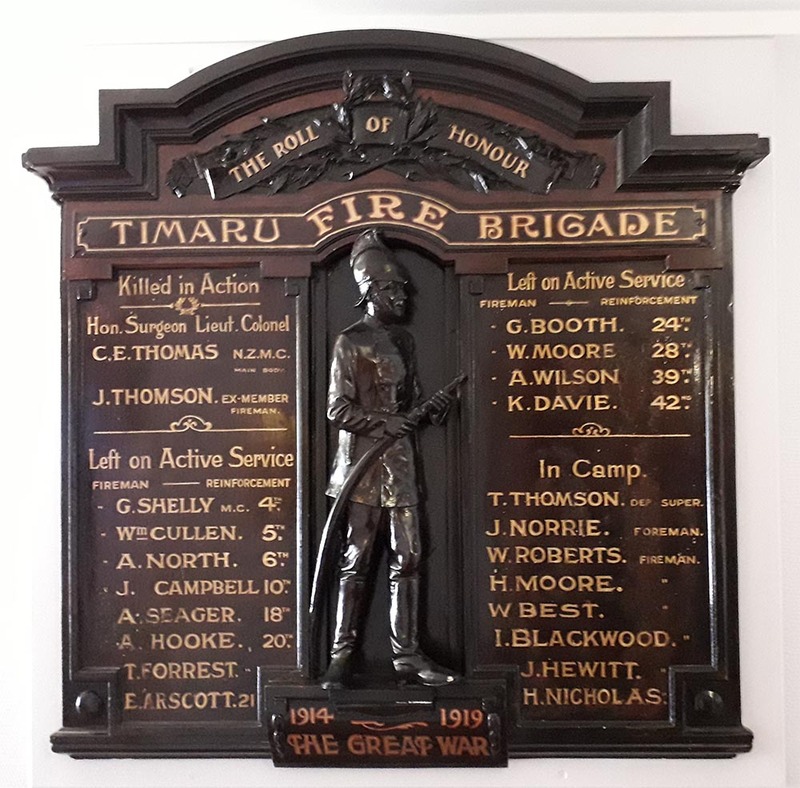 As well as being employed as a carpenter by Brown and Andrew, he was president of the Timaru Carpenters’ Union, a member of the Timaru Volunteer Fire Brigade, IOOF Lodge, Timaru Ambulance Brigade, and the Defence Rifle Club. On June 22, 1907 he married Miss Sarah Isabella Smart at Timaru. After their marriage they lived at 47 Grey Road, Timaru. George was aged 34 when he enlisted into the NZ Medical Corps on February 13, 1915. He was described as being Anglican, 5 foot 10 ¾ inches tall, weighing 165 pounds (75 kgs), chest measuring 36 – 39 ½ inches, having a fair complexion, brown eyes, light brown hair and good teeth. After training at Trentham Camp, Private Shelley left from Wellington with the 4th Reinforcements aboard HMNZT22 Knight Templer, on April 17, 1915. He was one of 2,254 persons travelling in convoy with HMNZT21 Willochra and HMNZT23 Waitomo, arriving in Egypt on May 25. George was soon serving as a medic on Gallipoli, but on September 24, was himself admitted to No 2 Australian Stationary Hospital, Mudros, with cystitis. After recuperation, he re-joined his unit at ANZAC on October 21, where he remained until evacuation to Alexandria on the “Ascanius,” on December 30, 1915. Back in Moascar he remained with the Medical Corps until he was transferred on February 2, 1916, to No 2 Company, NZ Engineers, becoming Sapper Shelley. He then proceeded from Alexandria, Egypt, on board HMT “Ascania” to France on April 8, 1916, disembarking at Marseilles on April 12. The engineers were the army’s skilled tradesmen who were tasked with maintaining communications, railways, roads, water supply, bridges and transport as well as constructing fortifications and maintaining weapons. Overall their aim was to assist the movement of friendly forces and impede the movement of enemy forces, and they were to be heavily involved in all the major battles on the Western Front. On October 23, 1916, George was promoted to Lance Corporal in the field. 1917 saw his unit involved in all three major offensive efforts – at Arras, Messines, and Passchendaele. It was in October during the Passchendaele battle that Lance Corporal Shelly was awarded the Military Medal for gallantry in the field. Further promotion to Corporal took place on December 8, 1917. From February 16 to March 5, 1918, he was detached to the Bridging School and his unit was to be kept busy with this for the remainder of the year. In July he had a short respite while attending a 10-day course at the IV Corps Gas School before being detached on August 12, to attend a NCO’s course to the Southern Command School of Engineering, in England. With the war coming to a close, on November 29 he was sent to the NZ Discharge Depot at Torquay, prior to embarking on December 8 at London, aboard SS “Ruahine” for his return home, arriving at Auckland on January 20, 1919. After having served a total of 4 years and 7 days, he was discharged from the army on February 19, 1919. For this service he was awarded the 1914-1915 Star, British War Medal and Victory Medals, along with his well earned Military Medal. After his discharge George returned to 47 Grey Road, Timaru. Due to his war service he was, from August to October 1919, treated for neurasthenia at Timaru Hospital, and again at Hanmer Military Hospital in February to March 1920. He later moved to Palmerston North where, in 1935, the couple resided at 53 Lombard Street, and from 1938, at 28 Lombard Street, carrying on in his trade of carpenter. George died here on March 3, 1962, aged 81 years and is buried in the Kelvin Grove Cemetery, Palmerston North. His wife Sarah died shortly after him on May 16, 1962, and is also buried in Kelvin Grove Cemetery.